The House in Poplar Wood is the story of two brothers, Felix and Lee, who live in a world where every town has three shades - Death, Memory, and Passion. These are mythical beings who make deals with humans and help regulate things, along with their apprentices. There are also Summoners in the town, who help keep the Shades in check. But things in this town are out of balance. Years ago, Memory and Death forced Felix and Lee's parents to make a dangerous deal. Ever since, their house has been split in two - Lee and their mom on one side, Felix and their dad on the other. Felix has never met their mother, and Lee has never met their father, despite being separated by only a few walls. Fortunately, Felix and Lee can meet each other on the neutral ground of the front porch. When Gretchen - the nosy daughter of the town mayor - gets suspicious, things start to unravel. 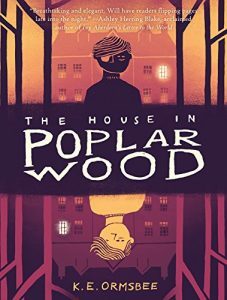 The House in Poplar Wood is an eerie story for fans of The Nest, by Kenneth Oppel, and A Series of Unfortunate Events. The setting of the town and the rules for the shades are creative with just a hint of creepy. Ormsbee balances the paranormal with an intriguing mystery that will keep readers guessing about what comes next.